Looks like Google is picking up some inspiration from Bing! 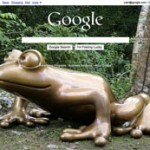 Google last week enabled custom backgrounds for its search page. Now this has been opened up internationally. The custom backgrounds are coming in from well known artisits who have created a gallery of background images that Google could use. There is a catch, you cannot turn off these images. Looks like Google is keen on making users have it and not letting them choose an option of a cleaner Google. Its like Google has something new that you have no choice but to accept it and see it. But afterall its their product use it or move on. When compared with Bing the pictures are too not well defined as they sit under the search engine’s search box. Bing has a nice setting where high resolution pictures are displayed. There is one way to turn it off, where you can actually use Google SSL which is a secure site of the search engine. Google SSL is still in beta but works pretty much like your regular Google.